Hyatt Regency Hong Kong, Sha Tin is the first globally-branded hotel in the New Territories. Located adjacent to The Chinese University of Hong Kong, and just a hop and a skip away from the MTR Station, Hyatt Regency Hong Kong, Sha Tin is Hong Kong’s latest urban resort with stunning views of Tolo Harbour, Kau To Shan mountains and Sha Tin Racecourse. The hotel is a few minutes by car from Hong Kong Science Park and Hong Kong Jockey Club. Multiple terraces and balconies create plenty of outdoor space, and oversized picture windows in the guest rooms allow light and scenery to flood in, taking full advantage of these breathtaking vistas. 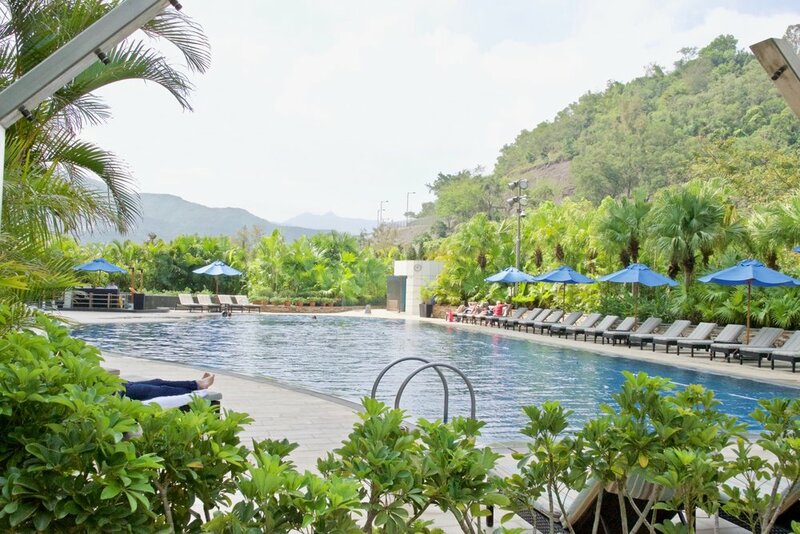 Making the most of its tranquil, green location are the top-notch resort facilities at Hyatt Regency Hong Kong, Sha Tin. An open-air relaxation area includes a 25-metre heated outdoor swimming pool, a whirlpool, a sun deck, a tennis court and Camp Hyatt — Hong Kong’s first resort-style kids club. Overlooking the pool area is a fully-equipped fitness centre, next to changing rooms that feature a whirlpool, a sauna and a steam room. A limited number of fitness centre memberships are available to the public. On 5th floor, Melo Spa is named after pomelo (in Cantonese, pomelo translates as Sha Tin grapefruit), from which the skin and fruit are used as treatment ingredients. There are nine all-inclusive private spa suites — four of which have private outdoor terraces overlooking the mountains — furnished with large whirlpool bath tubs, oversized rain shower cubicles, changing areas and grooming stations. Melo Moments, a specially designed room for foot / head and shoulder massage featuring 12 custom-designed lounge chairs with built-in foot basins, is perfect for pampering parties. Hyatt Regency Hong Kong, Sha Tin houses 430 guestrooms and 132 rooms and suites for extended stays with views of Tolo Harbour, Kau To Shan and Sha Tin Racecourse. We loved staying in one of the Regency Club rooms which are located on the 24th to 26th floors and provide access to the Regency Club facilities on the 25th floor. These facilities include a private lounge with a dramatic ‘sky terrace’, where guests can enjoy complimentary continental buffet breakfast, the all-day tea / coffee service and evening cocktails and canapés. The meeting rooms on Regency Club floors also offer workstations and boardroom-style settings that are exclusive for Regency Club guests. If you’re a foodie, Hyatt Regency Hong Kong, Sha Tin will have you sorted. There is café on the lobby level which features four show kitchens serving home-style Italian pizza, grilled prime meat and seafood, seasonal fruits and salads, as well as local Hong Kong cuisine fresh out of the pan, wok or grill. Further down the lobby is Patisserie, the perfect one-stop shop for parties and special occasions, offering an extensive selection of homemade pastries, breads, cookies, chocolates, cakes, and a variety of fine wines. Signature Sha Tin Apple Pie, Sha Tin Honey Cake (made with natural honey from Sha Tin), and homemade chilli sauces are excellent souvenirs. Two floors above, a backlit alabaster wall with an arresting bamboo design marks the entrance to the Chinese restaurant, Sha Tin 18. Offering authentic Cantonese and Northern Chinese cuisine, the restaurant features a dessert kitchen and tea bar; noodle and dumpling station with bar seating; wok kitchen; and a barbecue kitchen with two Beech ovens, which roast the restaurant’s signature Peking Duck. Off the main dining space are five private rooms as well as a vast outdoor terrace furnished with comfortable sofa seating, to best absorb the mountain views. (Read our full write up about Sha Tin 18 here). Also on the same floor, Tin Tin Bar’s vivid blood-red color scheme, zebra-print carpeting and round booths, make it a highly seductive space for evening drinks with music entertainment. Overlooking the outdoor swimming pool and Kau To Shan Mountains, Pool Bar provides the perfect setting to unwind with a refreshing drink and an all-day a-la-carte menu.